Failing to find any free software task manager I could live with, I created my own over the December holidays. I called it “Tody”. It’s a simple GUI app, focused on quick searching, editing, and tagging for tasklists. The file format it uses is identical to the plain text format used by Gina Trapani’s Todo.txt command-line tool and Android app, it even loads preferences from the Todo.txt config file. Since the file format is plain text, tasklists can be shared between machines (or users) over Ubuntu One or Dropbox. I created it using Rick Spencer’s Quickly templates (GTK, Glade, and Python). I went for a streamlined workflow for the way I use tasklists, so I’m curious if it will map well to others. It appears as a simple text file, with a search box at the top of the window. Clicking on a tag performs a search for the tag (these are similar to Twitter tags, any word that starts with “@” or “+”). The list sorts tasks by priority (marked with “A”, “B”, “C”, etc) and then alphabetically. When the list is limited to search results, the search terms are highlighted in the tasks. Clicking on the text of a task brings up an editor window, with a checkbox for “Done” tasks, a field to edit the task, and clickable palettes for task priorities and all the tags you’ve used previously in your tasklist. It’s streamlined with shortcuts, so typing Space, Enter marks a task as done, saves it, and closes the editor window. I’ve started using Tody as my primary task manager, after dumping all my old tasks from other task managers into one text file. I’d like to tweak the search feature, right now it does a completely literal string search, but I’ll change it to split up search terms (so it’s not sensitive to order of terms). Then the next step is to link it up with my Todo Lens, so the edit window for Tody pops up as the action for clicking on a task in the Lens. I am perpetually trying out online task management tools. My never-ending quest is to tame the massive sea of things I should be doing at any given moment, both making sure that important tasks don’t get lost in the mix, and to extract a reduction more closely approximating “the most important thing to accomplish right now”. My two favorites at the moment are Thymer and Rypple, but neither is perfect. I like Thymer’s simple task creation, twitter-like tagging of tasks, and the smooth drag-and-drop motion for prioritization. But, at the end of the day, it’s just a massive web page of “things I should be doing” and gives me no assistance in taming the beast. I have to manually prioritize each task, and if I want the priorities assigned to tasks to be at all relevant, I have to go on manually gardening them every day. And, while task creation is as easy as tweeting, task editing is a clunky collection of buttons and drop-down menus. The tags are handy in small numbers (and projects really are just tags with a slightly different display), but any more than about 10 unique tags/projects across my whole data set becomes a jumble at the top of the screen and not at all helpful in finding anything. Thymer offers some reporting features, but I never found them particularly useful. I like Rypple’s social features, it’s got a good take on sharing thanks and feedback, and the 1:1 pages (a collection of tasks you share with another person) are incredibly useful for weekly meetings with co-workers. I like the organization of tasks by goal rather than by project, it encourages grouping tasks into larger sequences toward an overall purpose. But, I found that I still needed some goals that were really just projects or a collection of semi-related tasks, so the construct was a little artificial. Rypple offers a tagging feature, but tag links don’t do anything useful (like take you to a page listing tasks with the same tag), and a task can’t live in more than one goal at the same time, so there isn’t really any good way to pull up a group of cross-cutting tasks. And, Rypple also gives me little help in managing the mass, though it has drag-and-drop priority setting similar to Thymer. The worst thing about both of them is that they’re neither open source nor open data. Philosophical considerations aside, this is an immediate practical problem, since my access to Rypple was only a free trial which is now ending. I started with the best intentions of only putting in a few things to try it out, but it quickly became an integrated part of my working life, and I now have well over a hundred little individual blobs of data (tasks) that I’m tracking there. Because it’s not open source, I can’t fire up my own instance of it. And because it’s not open data, I can’t get a dump of my tasks. So, I’ll have to manually copy every bit to some other task management system. Which means I’m in the market for a new task management tool, with a very immediate enlightened self-interest in picking something that’s both open source and open data. Yesterday, I tried out Todo.txt. The biggest appeal is the simple open data format, so simple that it would work just fine as a manually edited plain text file. But, it offers a GPL licensed command-line client for easier task creation, searching, sorting, grouping by project, priority, or “context” (a notion from “Getting Things Done“). It also offers a GPL licensed Android client, which is in the process of being ported to the iPhone. On the downside, it doesn’t offer any collaborative features, so I can manage my own tasks, but can’t share tasks with others, or even provide visibility to others on a subset of my tasks or projects. And while creating tasks on the command-line is clean and simple, actually viewing/managing my 100+ tasks on the command-line (or Android client) feels a bit like viewing an elephant through a pinhole. It doesn’t have a desktop GUI client, though the wiki offers some suggestions on ways to integrate the simple plain text format into other desktop tools like Conky. The results weren’t thrilling (not really any better than the command-line), but they did give me an idea: how about a Unity Todo Lens? I spent a few hours hacking on that, parsing the Todo.txt format in Vala and displaying the results in a Unity Lens with a general search box and filters for Project, Priority, and Context. I’m pleased with the result for a short experiment, but there are some drawbacks. The Lens really wanted my filters to be statically compiled in advance, while I wanted to create the filter sets on-the-fly from the Todo.txt file (i.e. let me filter by Projects that are in my tasks, not for some list of projects determined in advance). I may be able to hack around that with more time or a Python Lens instead of Vala. 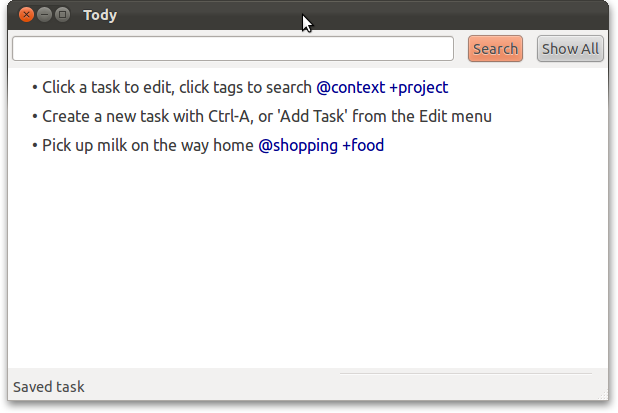 Also, a Unity Lens is a great interface for searching tasks, but not great for managing tasks. There’s only one “action hook” for a task, when you click on the icon/title. You can make that one action do anything you want, but it’s still only one action. I could make that one action mark a task as done (that seems most logical), but I’d still have to go back to the command-line to add new tasks, and edit task descriptions, priorities, projects, contexts, etc… Which takes me back to the original problem that the command-line isn’t a great interface for those tasks. What I really want is a slick, simple GUI client that the Lens could launch whenever a task is clicked in the search interface. Possibly a project for another weekend. That’s all the time I have to work on the idea right now. While I leave it sitting for a bit, any suggestions on free software+open data task management tools you love? Or hate? A recent blog post about a user who was having trouble installing Ubuntu on an HP machine, sparked off an urban legend that UEFI secure boot is blocking installs of Linux. To calm FUD with facts: the secure boot feature hasn’t been implemented and shipped yet on any hardware. It was introduced in the 2.3.1 version of the UEFI specification, which was released in April 2011. Hardware with secure boot will start shipping next year. It’s important to distinguish between UEFI in general and the new secure boot feature. UEFI has been around for a while, starting its life as the “Intel Boot Initiative” in the late ’90s. It has a number of advantages over old BIOS, including substantially faster boot times, the ability to boot from a drive larger than 2.2 TB, and the ability to handle more than 4 partitions on a drive. The UEFI specification is developed by the members of the UEFI Forum, a non-profit trade organization with various levels of free and paid memberships. UEFI is not a problem for Linux. At the UEFI Plugfest in Taipei last week, Alex Hung (Canonical) tested Ubuntu 11.10 on a number of machines, with success even on pre-release chipsets. The few failures seemed to be related to displays, and not particularly to UEFI. The secure boot feature of UEFI is a concern for Linux, but not because of the specification. The features outlined in the 2.3.1 specification are general enough to easily accommodate the needs of Linux. But, within the range of possible implementations from that specification, some alternatives could cause problems for Linux. For full details, I recommend reading the two whitepapers released by Canonical and Red Hat and by The Linux Foundation. The short version is that secure boot uses signed code in the boot path in much the same way you might use a GPG signed email message: to verify that it came from someone you know and trust. The beneficial ways of implementing this feature allow the individual (or administrator) who owns the machine to add new keys to their list, so they get to choose who to trust and who not to trust. The harmful ways of implementing this feature don’t allow the user to change the keys, or disable the secure boot feature, which means they can’t boot anything that isn’t explicitly approved by the hardware manufacturer (or OS vendor). This would mean users couldn’t just download and install any old image of Debian, Fedora, Red Hat, SuSE, Ubuntu, etc. So, there’s real potential for a future problem here, but we’re not there yet. At this point, it’s a matter of encouraging the hardware companies to choose the beneficial path. I’ve been chatting with the Ubuntu user who had the install problem, to see if we can find the real bug. It’s a friend’s machine rather than his own, so he doesn’t have easy access to it. I’ve arranged to get access to a similar machine next week to play with it. I’ll post back here if I find anything useful or interesting. I’ll take Dave Neary’s comments about private conversations to heart. To provide a little historical illumination, five years ago Dave and I founded a group, FLOSS Foundations, as a collaborative mailing list and face-to-face meetings for leaders in free/libre/open source software projects, focused on the community governance and legal structures of the projects rather than code. At the time, there was some ill will between various foundations, but as we talked we found that most of the roots of that ill will were in a lack of understanding. As a world-wide multi-project FLOSS community, we are a diverse collection of cultures, customs, and governance structures, and some things that seem strange to an outsider or a member of a different subgroup make perfect sense when you look more deeply. Dave and I have watched the Foundations group grow from a handful of people to a couple hundred, covering 50+ different projects. The most impressive thing about it has been watching the community grow to the point that we can discuss controversial issues with sharply divided perspectives among the group, but always in an attitude of open discussion and mutual respect. It’s such a healthy, mature forum for discussion, that when an occasional new-comer launches into the list in flames, the universal attitude is “let’s help them understand the group”. I haven’t seen anyone flameout twice. With that half-decade of experience in how multi-project collaboration can work, I agree with Dave that we can do so much better, not just with GNOME, KDE, and Ubuntu, but with the whole sky full of constellations that make up the Linux desktop and beyond. To go public, I’ve been talking with various people for a month or so now (in email/IRC/etc) about starting up a series of face-to-face meetings and mailing list(s), very similar to what we did with FLOSS Foundations, but focused on code, and specifically around the ecosystem of the Linux desktop. So far the response has been positive. It’s just the barest seed of an idea, and needs a great deal more conversation on what form the collaboration might take, what the goals might be, who might participate and how. Dave’s post has some good ideas on structuring conversations around focused collaboration tasks. I’d love to talk about any thoughts you have, in any channel of communication you feel comfortable with. Along the way I found that there’s already a list on FreeDesktop.org created for the express purpose of collaborating across desktop tookits (ctd@lists.freedesktop.org). It hasn’t seen much traffic lately, but I talked to the list admin and he’s totally happy to have it revived. I’m not particularly tied to that list (actually, I’m really tempted by watercooler@lists.freedesktop.org), or FreeDesktop.org, or any one method or path of collaboration. What’s important to me is that we take the ongoing conversation, and the increased level of openness in that conversation that we’ve seen over the past week, and carry it on into a longer-term effort of healing and strengthening. Dave mentioned the upcoming Desktop Summit, and I hope we can plan some face-to-face meetings around this conversation there. And like Dave, I hope we can continue the conversation in other forums between now and then. I know it’s tense right now, but I’m absolutely certain we can work through this, and collaborate more effectively in the future. This collaboration is not only good for the projects directly involved, it’s also good for the ongoing progress of Linux and software freedom, and absolutely essential for the future of technology as a whole.